A caring funeral home that serves bereaved families in Sighthill, West Edinburgh. Excellent pleasant service from start to finish. This funeral home in Sighthill is proud to be a part of Scotland’s largest independent co-operative, with a rich history spanning over 150 years. Scotmid is proud to be at the heart of the local communities it serves, with its Sighthill office located in the west of Edinburgh. Their office is situated next to the Scotmid food store, and opposite The Silver Wing pub. There is plenty of off street parking available. Close to Calder Road, one of the city’s main arteries and the Edinburgh-Glasgow & Stirling railway line is nearby. Scotmid has been an excellent funeral director in helping me and my mum organise my Grandad’s funeral. Elaine from the Sighthill branch was a godsend and was down to earth and was so helpful. Thank you for your 5 star review Alison, we thank you for allowing us to assist you. I will pass you comments onto Debbie, Christine and the team. With our best wishes Scotmid Co-operative. 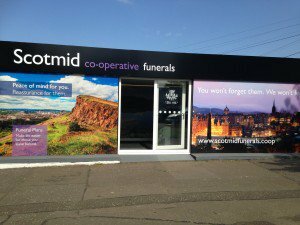 Scotmid Funerals, Sighthill will provide you with a free obituary as part of their service.